1. Shoppe, via Scoutmob. Ready to be charmed…and addicted? Check out this well-curated showcase of wares made by independent craftspeople. They even offer a downloadable app, where you can learn about handmade products and hip happenings in major metropolitan areas. I bought myself an amazing tote bag with leather handles, and a super-cute pendant necklace, for under $50. Whoa. 2. 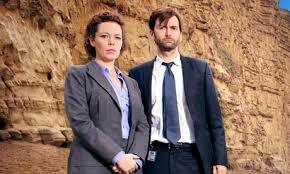 “Broadchurch.” A suspenseful BBC murder mystery (starring David Tennant, for all you Dr. Who fans), set in a quaint seaside town where everyone has SECRETS. My kind of story. 3. Figs. They were on sale at my local supermarket this week, and “impulse buy” is my middle name, so I bought two pints. How do I love thee, figs? Let me count the ways. So far, I have eaten them for dessert with mascarpone and honey, and I’ve made them into a jammy spread (with brown sugar, balsamic vinegar, and a little bit of water) that I ate for breakfast this morning (on toast with more mascarpone and honey) and will eat on a pizza tonight (with ricotta, prosciutto, and arugula). The possibilities are seemingly endless, and friggin’ (or would that be “figgin'”?) delicious! Most people associate pumpkins and apples with fall; I think figs are an unsung autumnal flavor, don’t you? 4. Ben & Jerry’s Volun-Tiramisu Ice Cream. My friend gave me a pint of this for my birthday. It’s coffee mascarpone ice cream with cocoa-dusted coffee-rum ladyfinger pieces. I kid you not. It’s like they took heaven and made it into an ice cream. It’s a limited edition flavor, because it’s clearly too good for this world. 5. These boots. Because I refuse to sacrifice my penchant for stylish footwear now that I’m a mooooooom (that last part delivered in a sanctimonious mommy voice). And these lovelies are surprisingly comfortable, so far. I’ll get back to you once the little man is walking and I’ve been running after him. At the rate he’s growing, that should happen any minute now. I heard good things about Call the Midwife before, but just couldn’t get into it while I was pregnant. But now I think I’m ready to give it another shot! I think all the ingredients cbmioned sound heavenly, I know this is something I would definitely love. Figs and cheese are just meant to be eaten together. I must have missed this one in the magazine, going to have to look for it.